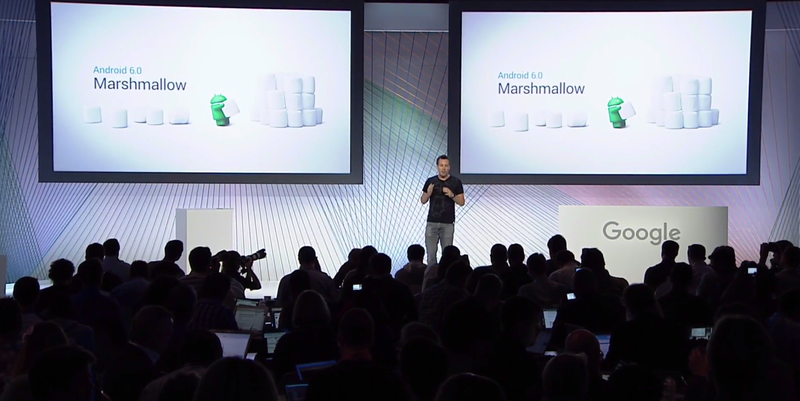 At today’s Google event, Android Marshmallow was discussed a bit more in-depth. With things like fingerprint sensor technology and external storage support, Google’s sweet OS is growing up. Privacy plays a big part in Android Marshmallow. App permissions remain a focal point, and those designed for Android Marshmallow offer more granular control over what information you share. Fingerprint sensing technology is now baked into Marshmallow, and adds a layer of privacy and personalization iOS are familiar with. Look for Android handsets to get dedicated sensors over the next year or so. Your voice is also going to be central to your experience with Android Marshmallow. Third party apps that make use of voice interaction will let you launch directly from the voice input screen. Saying something like “Okay Google, play Katy Perry in Play Music” would launch directly into some pop music. Apps can also work in continuation with voice control. If you left an app in the middle of a task, and relaunched it later, Android may ask if you want to start a new task or continue where you left off. The voice features can also be launched from the lock screen. If your device firmware has been altered in any way, the boot screen changes. A new heads-up notification scheme ‘bounces’ a banner on your screen, which is easily dismissed or expanded. The app drawer is also a bit more contextual, and learns what apps you use during the course of your day. It populates your favorites towards the top of the drawer. External storage is also supported, and keeps things like apps tethered to your device via encryption. It’s something Google calls Flex Storage, and it suggests Android is set to be more than a smartphone operating system. Android Marshmallow will launch next week to Nexus devices (5, 6, 7, 9 and Player).